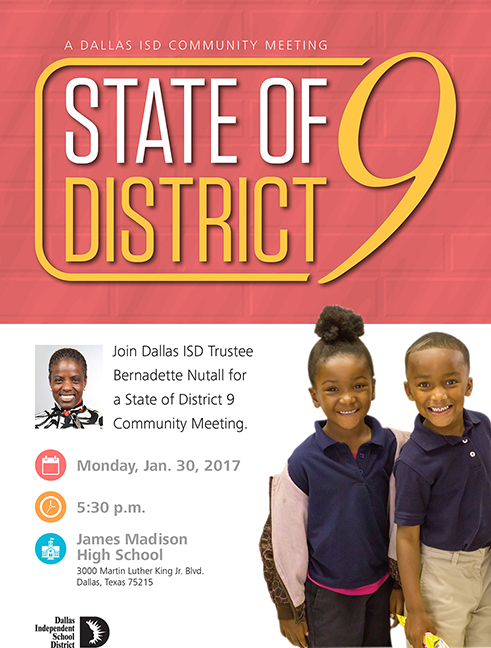 Trustee Bernadette Nutall will host a State of District 9 Community Meeting starting at 5:30 p.m. Monday, Jan. 30, at James Madison High School. 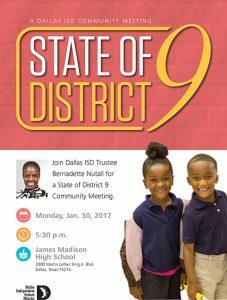 Parents and community members living in District 9 are encouraged to attend. The district encompasses south Dallas, parts of Downtown Dallas, Pleasant Gove, Deep Ellum Uptown and East Dallas. Elementary schools: Blair, Burleson, Callejo, Douglass, Dunbar, Gonzalez, Guzick, Ireland, MLK, Mata, Rhoads, Rice, Rowe, San Jacinto, Silberstein, Starks, Tatum and Urban Park. Middle schools: Comstock, Dade, Piedmont GLOBAL, Ann Richards and Lang. High schools: Evening Academy, Lincoln, Madison, Rangel, Skyline, Booker T. Washington. Madison High School is located at 3000 Martin Luther King Jr. Blvd.